“Nothing justifies killing of innocent people.” Tony Blair, CNN, 15th January 2015. After the attack on a concert in Manchester two weeks earlier, killing twenty three, injuring one hundred and nineteen, twenty three critically, Islamic State responded that it was a response to Britain’s: “transgressions against the lands of the Muslims” and a victory against “the Crusaders.” Bush and Blair, please note. As US and British bombs drop and allied soldiers slaughter, year after year, decade after decade, in majority Muslim countries, it is, as in London, Paris, Berlin, Brussels, Nice, the innocent going about daily business, enjoying an evening meal, celebration or sports event who pay the ultimate, heartbreaking price. In Iraq and other countries under “allied” assault it is also those called “insurgents” who are in fact simply nationals who want their country, illegally invaded or attacked, back. The UK belongs to the “Global Coalition”, a sixty eight country partnership across Europe, the Middle East, Asia, Africa and the Americas “committed to defeating IS”, seemingly regardless of human cost and reducing countries to rubble. In all, the U.S. bombed Iraq, Syria, Pakistan, Afghanistan, Libya, Yemen, Somalia in 2016, raining down an average of seventy two bombs a day, the equivalent of three an hour. 1,337 were dropped on Afghanistan, up from 947 in 2015, three on ally Pakistan, fourteen on Somalia and thirty four on Yemen. “May’s speech did not address allegations that in 2011, while she was Home Secretary, Libyan Islamists previously under surveillance in Britain were given back their passports and helped by the government to fly to Libya to fight Muammar Gadaffi’s regime. “Labour leader Jeremy Corbyn has made the U.K.’s uneasy alliance with the Saudis an election issue, with voters going to the polls on June 8th. 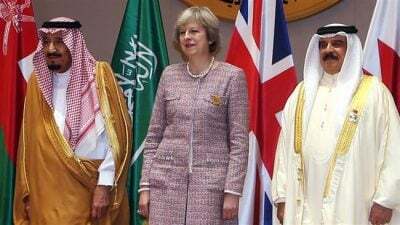 The Tories’ ties to Saudi Arabia, Labour leaders charge, have resulted in record weapons sales – Conservative governments have licensed £3.3 billion ($4.2 billion) in arms sales to the Saudi military since the onset of the Yemen campaign – and a reluctance to criticize human rights abuses. Apart from accusations of double standards on human rights and terrorism, there is another towering double standard. As always, rightly, when there is a tragedy in the West, world leaders send messages of sympathy and outrage, the Eifel Tower or Brandenburg Gate go dark or display the victim country’s colours. Heartwarming messages poured in to London from leaders across Europe and the world offering prayers, solidarity, hearts and minds. The exception was Donald Trump who can ever elevate tastelessness to new heights and used the grief of others to push his travel ban and to insult the (Muslim) Mayor of London. The dead alleged terrorists have not been publicly identified by the police and authorities yet, but it has been reported that one has Irish identity documents. Perhaps Trump will rain 59 Cruise missiles down on Ireland. Back to double standards, in just two examples out of Iraq’s daily horrors, in July last year in vibrant Karrada, central Baghdad, two hundred and ninety two people were killed and over two hundred injured in a terrorist attack. In between those two carnages have been near daily others across the country since 2003’s invasion, as in Afghanistan since 2001, Syria and Libya 2011, Palestine’s approaching seventy years devastations. 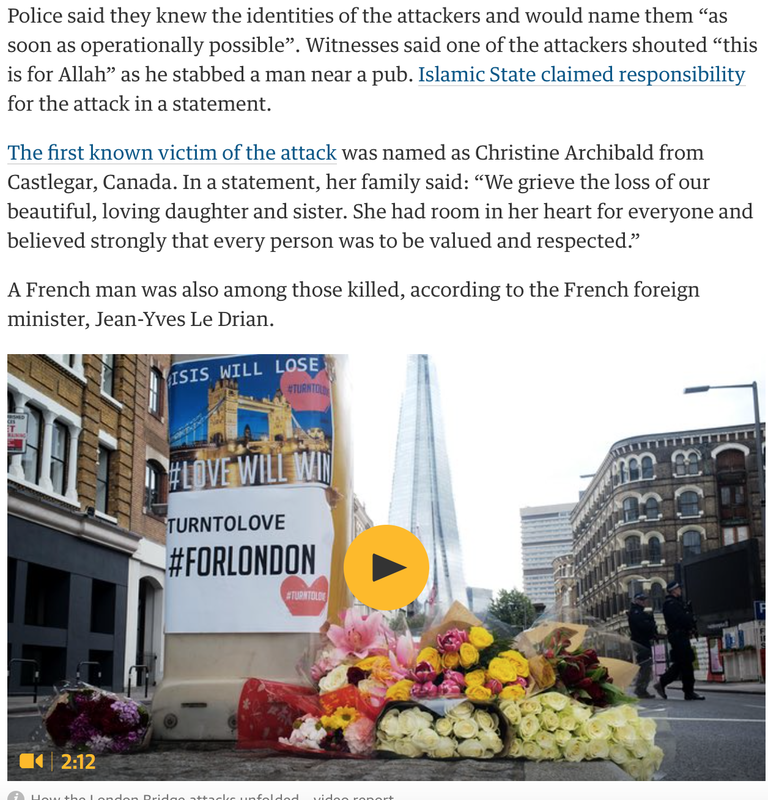 How many Western world leaders have sent prayers, thoughts, solidarity, hearts and minds?